On my way to work this morning I realised that the blower in my car (Nissan Rogue 2010) wasn't working. No air was pushed in the car, no matter the speed the knob was set to. 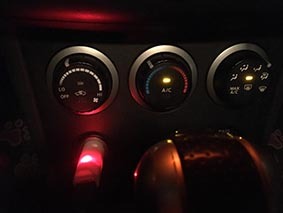 The light on that knob, for recirculation, also won't turn on. Do you have any suggestion as to what the problem might be and how to troubleshoot it? Here is a picture of the controls, all apparently working apart from the left knob. EDIT : Upon further verification. The light on the know does work afterall. So I guess the problem lies with the blower itself. Do you know how I could confirm that? You need to test for power and ground arriving at the motor when turned on. Which one is missing will determine the next step.